Nestled out by the River lies the Motley Family Home. Being Florida Natives, living near the wanter meant an abundance of family fun, whether it be water sports on the weekends or a midafternoon hike throughout Snell Park, the Motley Family is always able to enjoy the natural beauty of one of Florida’s State Parks. Life Happens in the Kitchen. From kids eating breakfast and getting ready for school in the mornings, lunches being made, to settling down for a good night’s dinner. Your Kitchen sees a lot of wear and tear on a normal basis. Kitchen Remodels are a popular home renovation project that can vastly increase the appearance and perception of the space. The right kitchen layout, with ample amounts of Countertop Space has become a staple in most Kitchens today. Kitchens are one of the biggest things buyers look for when selecting a home to purchase. After living in the house for over a year, they decided it was finally time to redo the Kitchen. The Cabinetry and Appliances in the Kitchen needed to go. After shopping for Cabinets, Countertops, and Appliances at Lowes, The Motley’s came to International Granite and Stone. They knew they wanted a light colored countertop, but something that looked like Marble. With Jessica’s help, the client’s chose Calacatta Quartzite, a white stone with marbled accenting. The Motley’s also chose a special upgraded Edge Profile for their Kitchen Island, called a Cornice Edge. International Granite and Stone is the only Fabricator is Florida with the Machinery capable of producing this elaborate stacked edge. The Edge can only be applied to a 6 CM edge, so IGS was able to laminate a little bit of extra material under the edge of the countertop, to beef up the material for the Edge work. The effect could also be achieved by making the entire Countertop out of 6CM material, but that would add additional weight onto the Cabinetry, as well as additional cost. 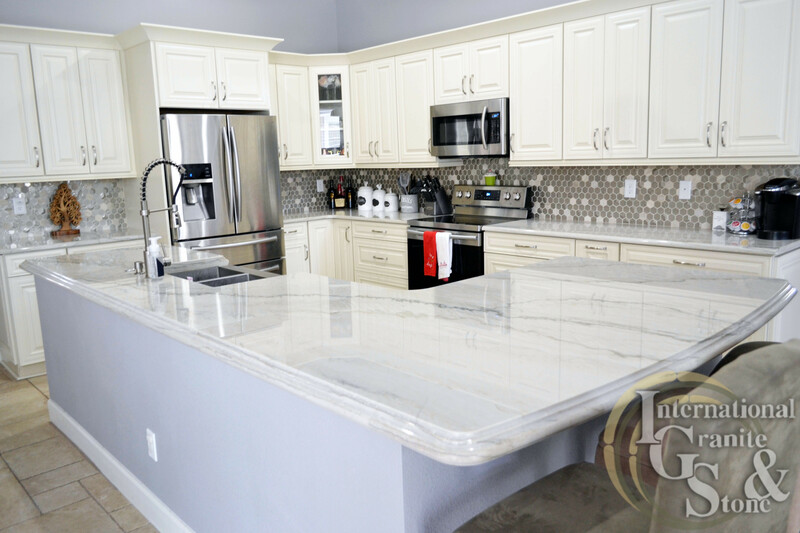 “We got the Cabinets from Lowe’s and got a quote for Countertops, but we felt much more comfortable doing the Counters through IGS. International Granite and Stone’s turnaround time was faster than Lowes, and we needed Countertops done ASAP.” Mr. Motley said. After the immense success of their Kitchen Countertop Project, the Motley’s went ahead and scheduled a Consultation to see about redoing their Bathrooms and Laundry Room. To match the Kitchen, they decided to use the same material throughout the two Bathrooms and Laundry Room. In Both Bathrooms, they mounted Gorgeous Decorative Mirrors to the wall, giving it a modern, inviting feel. In the Master Bathroom, they used LED illuminated Vanity Mirrors, as well as decorative chandelier lighting above each sink. In Both Bathrooms, the owners decided to use modern square undermount sinks. Both of these bathrooms, as well as the Laundry Room, have a three-inch backsplash made from the Quartzite to protect the walls from any splashback. Three Inch Backsplash is a common countertop practice, not only does it make the space look finished, it provides protection and helps fill in any gaps between the wall and the counter. With an In-Home Appointment and Jessica A.’s Help, The Motley Family Chose a White Quartzite called Calacatta Quartzite, for Its Strength and Beauty. Quartzite Is a Cousin of Marble. Featuring the look of Marble, with more Durability. Quartzite is a harder stone than Marble but still requires Sealing and Maintenance over the years. Lighter Colors Are In Right Now and Are Heavily Preferred By Customers. The Customer Also Chose Interlocking Tile for The Backsplash to Complement the Quartz and To Protect the Walls from Stains. At International Granite and Stone-Sarasota, We Make It Easy to Get New Kitchen or Bathroom Countertops. Shop Online, Schedule a Free In-Home Appointment or Visit our Cambria Quartz Premier Gallery of Sarasota, Featuring: Cambria Slabs, Kitchen and Bathroom Displays, Samples and More.